Map It! Okinawa: "The Purple Iris Fields of Kijoka"
"The Purple Iris Fields of Kijoka"
Aside from the Kijoka Falls, the town of Kijoka also hosts a very beautiful green field full of purple irises. The general blooming time for these flowers here in Okinawa is between the late month of March through early to mid-April. Just like the Cherry Blossoms, timing is critical if you want to see these flowers in their best performance. The roughly 1 square km field of lush green iris stems and leaves highlight these purple wonders under the morning sun. The exact scientific classification of these simple flowers, however, has proven to be somewhat more complex. Conflicting scientific terms have surfaced. They are part of the Iridaceae Family, but the exact specie type is left to question. Research sources, such as The Society for Japanese Irises, The Iris Encyclopedia, and The American Iris Society were reviewed, but an exact classification could not yet be determined with 100% accuracy (This post will be updated upon new findings). One thing is for certain however, is that the Okinawans refer to this particular iris as 'Okurareruka' (written in Katakana as オクラレルカ). There is a species called 'Iris ochroleuca' with the second half of the name mimicking the pronunciation 'Okurareruka' in Japanese. However, conflicting images have surfaced depicting the flower as all white instead of purple. It is quite possible that these purple irises of Kijoka were initially given the classification of 'Iris ochroleuca' and later found to be of a different kind, while the name, 'Okurareruka', had taken root among the Okinawans. 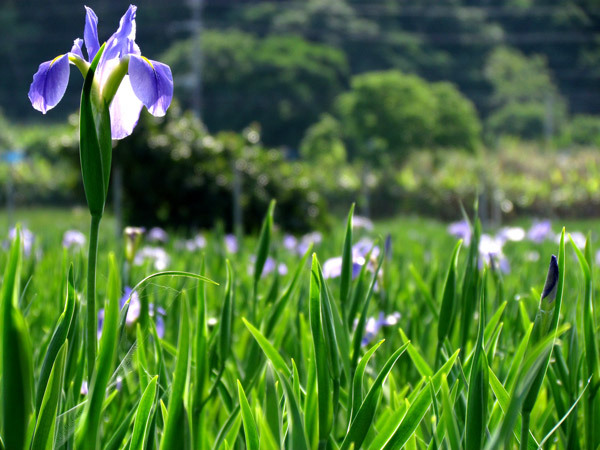 Kijoka is found in Ogimi Village and they have provided a website link displaying the blooming phases of the Kijoka Iris Fields. 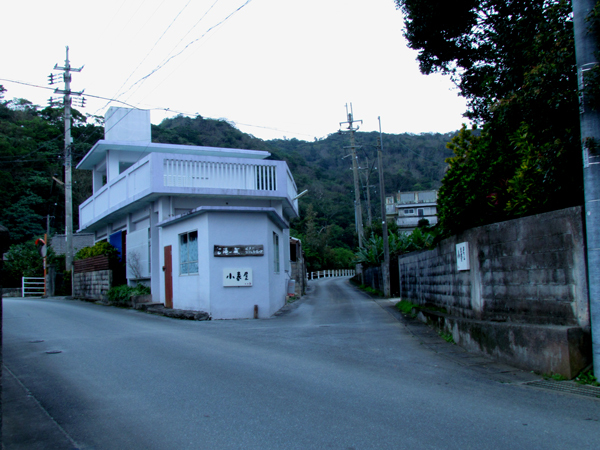 Please visit link http://www.vill.ogimi.okinawa.jp (Japanese). Blooming Season. Late March to early to mid-April. Best time to view is 7-10 days after first bloom. Related Articles. 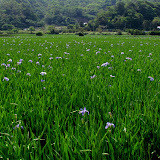 For other related images of the Kijoka Purple Iris Field, see Mike's Ryukyu Gallery at: http://blog.mikesryukyugallery.com/2012/03/2012-okinawa-iris-flowers-are-starting.html. Directions. The directions is the same as if you were going to the Kijoka Falls. 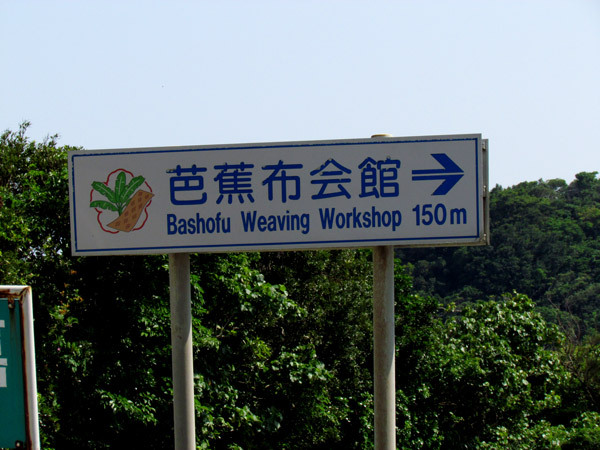 If you are going north on Highway 58, look for the 'Bashofu Weaving Workshop' sign to know where to turn off (start of the blue route in the map above). After the turn make the first right. Follow this road and continue straight. Instead of turning right at the LandMark Building that takes you to the Kijoka Falls, continue straight. Once you pass this LandMark, you will want to look to your left and look for the lush green fields. It's not difficult to find. 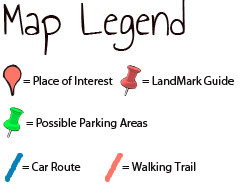 Navigate your way through and park in some of the open areas provided. Avoid parking in areas that might disrupt traffic. Other places of interest nearby. The Kijoka Falls. Excellent directions -- wandered up there this week and had no problem finding the irises! GT, Glad you could make it up there. Kijoka is a quiet and beautiful place. Thanks for the comment.